First, inquisitive gamers found “evidence” that Valve might bring Steam, its popular Windows game store, to the Mac, and it was good. Then, Valve seeded some provocative teaser images to Mac press which all but confirmed 2010 to be the year of Mac gaming, and it was great. Now, another piece of the puzzle may be falling into place, showing that one of Valve's new games may be on its way to our favorite platform as well. 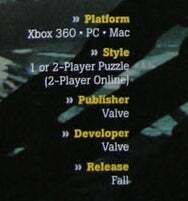 Scans from an article in GameInformer’s forthcoming April 2010 issue, posted in this PAL Gaming Network forum thread, list the Mac as a platform for Portal 2 (pictured above). Valve did mention the original Portal (released in 2007) in those aforelinked teaser images, along with a couple other back catalog games like Left 4 Dead (2008) and Half Life 2 (2007), but Portal 2 is a sequel due out later this year. If true, it means Valve could be making an effort to release at least some of its current and upcoming games on Windows and Mac simultaneously. This is more great news for aspiring Mac gamers hoping for simultaneous releases of major games. We're still awaiting official news from Valve, and there's still no word on how many third-party publishers (if any) are on board for the rumored Mac debut of the company's Steam marketplace. However, the annual Game Developers Conference (GDC) kicks off at Moscone Center in San Francisco tomorrow. If Valve is going to release all this pent-up pressure anytime soon, you can bet that it’ll happen at GDC this week.